Steiff Paradise Jungle Collection Margarete Steiff GmbH Limited Edition Teddy Bear handcrafted in Germany of fine Mohair, with "Button in Ear". Meet Livingstone The Explorer, your tour guide through Paradise Jungle. Livingston knows his way around Paradise Jungle better than anyone - come along and let him show you the way. He is ready to take you on the journey of a lifetime. 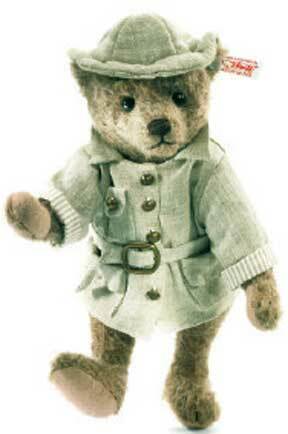 Dressed in his linen safari outfit complete with hat and stylized coat with dapper brass buttons and belt buckle, Livingstone is ready to show you the sights. He is made of caramel-colored felted mohair and has light wool felt paw pads. His nose is hand-stitched and his shiny black eyes catch every detail. German toymaker Margarete Steiff started in 1880 in the town of Giengen an der Brenz, Germany. From November 1904 onwards, every Steiff had a "Button in Ear". Livingston The Explorer Bear is a Limited Edition of 1,500 World Wide. Size: 11.00 inches. Caramel Mohair. 5-way jointed. Surface washable. 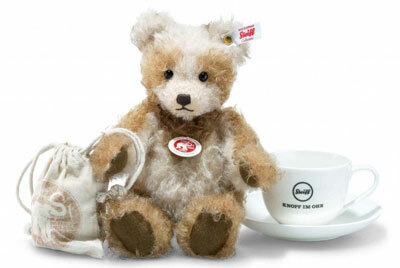 STEIFF EAN# 034985.